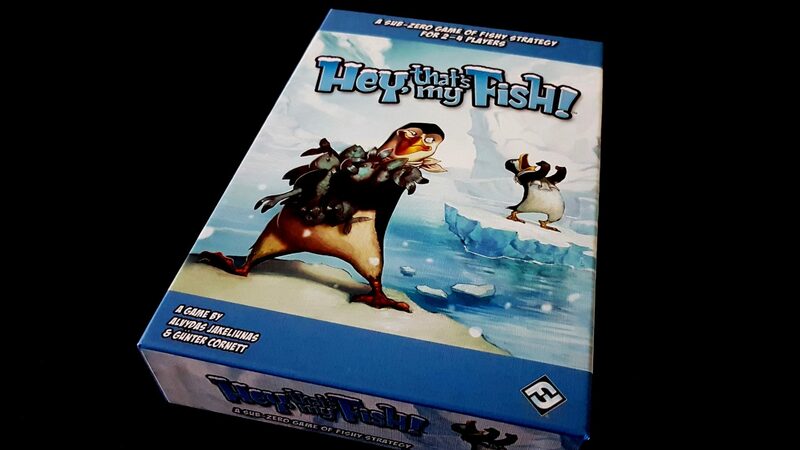 If ever you were looking for ‘An Inconvenient Truth, the Board Game’ then you should consider giving Hey, That’s My Fish a try. The box might suggest this is a cheerful game of happy birds grabbing fish from under the beaks of their compatriots in a friendly competition. The gameplay though is more akin to a brutal simulation of the impact of a breaking ice-shelf on the indigenous penguin population. It’s Al Gore’s nightmare viewed through the prism of Disneyfication purely to dull the horror. Hey, That’s My Fish is pretty much exactly as light and breezy as it appears. It’s mechanically simple and yet possessed of a fair degree of tactical depth. It manages to straddle the line between being uncomplicated to play and yet challenging to win. 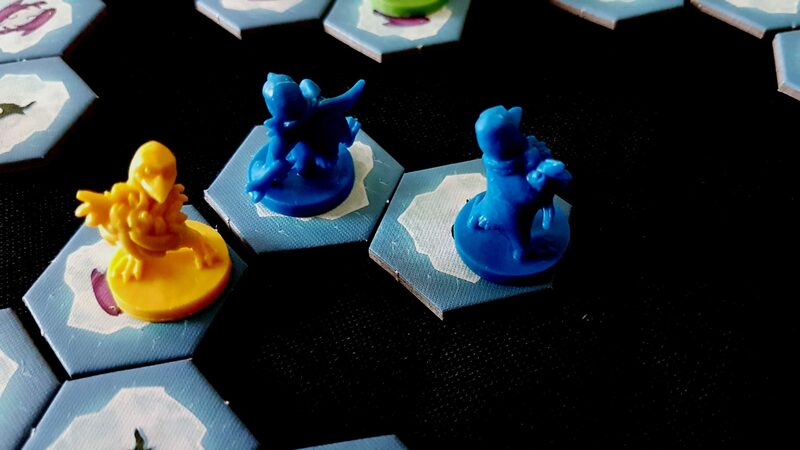 Confronting the unfortunately grim subtext of drowning penguins and Antarctic erosion is not a necessary prerequisite to play. You’d probably be happier not troubling yourself with it. I know I am. A troubling conversation about the imminence of an extinction level event need not be part of the rules or the context of play. That’s good, because this is a game aimed in part at kids. They deserve a few years of dumbly uncomprehending happiness before they die in their millions during the inevitable water wars of the near future. Given the looming apocalypse on the horizon, it’s vital that we all try to wring everything we can out of every moment put in front of us. Unfortunately, Hey That’s My Fish represents an unusually poor way to maximise the value of the scant remaining hours you have before the grave takes you, This is a game that needs you to invest as much time in setup as it does in play. That’s a big problem here because play-time is very brisk – you’ll often be done with a round of the game in ten minutes. At the end you’ll be confronted once more with the administrative chore of setting up the tiles before you can play again. Who wants to do that on a regular basis? None of us, surely. We’re all brief candles between two immensities of darkness. It’s hard to justify spending our flickering light on a game with such a skewed perspective on the value of your time. Settle in, this might take a while. 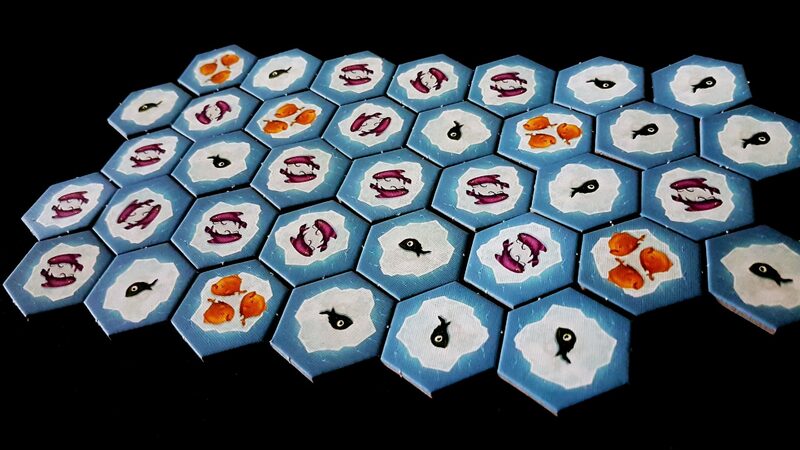 There are, you see, a lot of tiles in this game and they need to be arranged neatly to create the gaming environment. 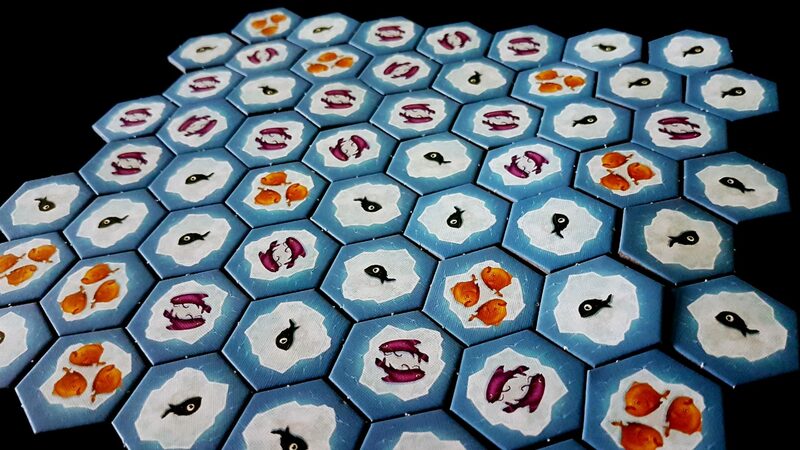 Each tile has between one and three fish marked on it, and each represents a scoring opportunity for the penguins we will later scatter around the ice floes. Each time we score, we collect up the tile under the feet of our little penguin marker. The randomised nature of the game grid has a big impact on how each round plays, and the cost of setting it up is high. I’d go as far as to say it’s higher than the benefit that comes from playing and that’s a harsh thing to say about any game. Are we only half way done? Seriously? I mean, look at that – we’re only a little over half way done with this grid and there’s still plenty more before you get to play. I have timestamps on photographs taken of the start, middle and end of the setup process and it’s a total of seven minutes to get from opening the box to taking the photo of the finished setup. It’s not necessarily a critical issue if you’ve decided the game is for you – but it’s enough to send me scurrying to the (excellently implemented) app whenever I feel the urge to play. As much as I enjoy the tactile and social experience of tabletop gaming sometimes it represents a singularly poor investment of time and effort and I think that’s the case here. 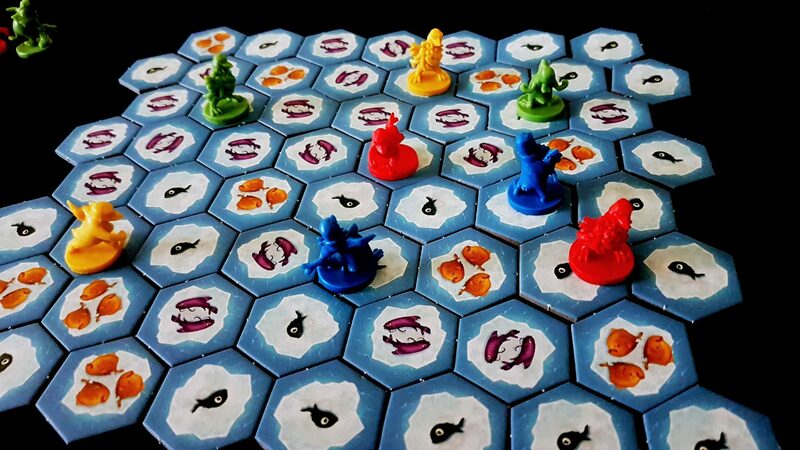 Once you’ve built up this grid and worked your little fingers to the bone to make it semi-neat, each player in turn takes one of their penguin markers and places it on a single fish tile anywhere on the ice-shelf that has been created. For two players, you each have four penguins. For four players, you each have two. There is a substantial change in the experience that accompanies different player counts, but the game plays well in each variation. It’s this alternative model of penguin distribution that guarantees that. 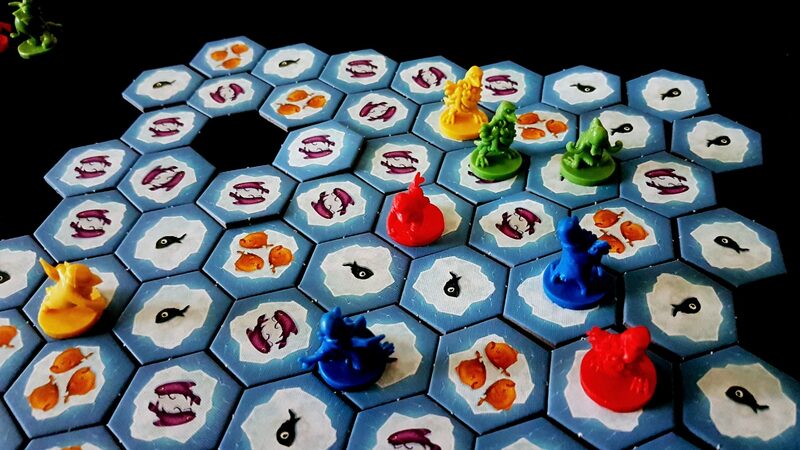 No matter the player count you use, you’ll have plenty going on at all times in the Antarctic. It’s important that this frozen shelf is heavily populated because it is foot traffic that channels the forces of erosion that will win, or lose, the game for everyone involved. The differing penguin count means that there are always fewer places to stand than you might like. It’s like an an Attenborough documentary on your desk. 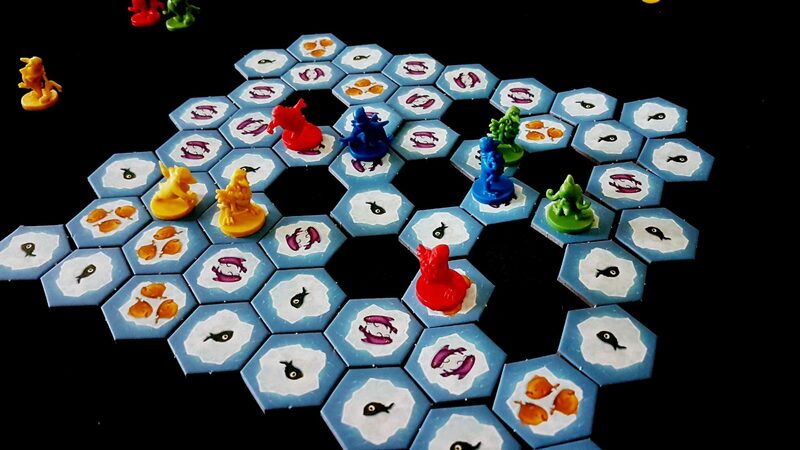 On each of your turns, you choose one of your avaricious avians and move them in a straight line somewhere else on the game board. The tile that you vacate in the process is picked up and added to your collection. That obviously impacts upon your score, but more significantly it has the effect of curtailing the options for movement available to everyone else. Penguins always move in straight lines and they can’t route around damage. The first piece of the map being collected doesn’t have a big impact, but by the time your turn comes around again you might find yourself in metaphorical hot water. It’s metaphorical because the icy chill of the real waters here can flash freeze a penguin in under thirty eight seconds. If penguins must perish, you want them to be those of your opponents. You want to keep your birds dry while dunking those of everyone else. That’s literally all there is to the game rules – you pick a penguin, you move it, you collect the tile you just vacated. If a penguin has no legal moves it can make on its turn, it is cast off of its precarious foothold and into the freezing depths of the Antarctic never to be seen nor heard from again. With that in mind, you pay attention when people move their penguins because positional avicide is not just a byproduct of the movement. It’s the primary tool you have to gain game advantage. You’re not just meandering around, picking the choicest cuts of the juiciest silverfish. You’re actively looking to position yourself to create an ice archipelago riddled with holes that trap and strand other penguins in ways that leave them bereft of opportunity and short of lifespan. On the face of it, all you’re doing is moving penguins to the largest source of fish and hoovering it up like a puffin at a buffet. That works too, after a fashion, because the random distribution of tiles makes for a scenario where wealth is intensely unevenly distributed. There will be rich clumps of three fish tiles, and long stretches where only the comparatively meagre catches of singles are available. The obvious approach is to beeline for the most bountiful tiles and ignore the rest. One problem is that the obvious approach is obvious to everyone. The other problem is that it’s not how you actually win this game. The pressures you need to exert on other players are not linked to consumption, but instead to territoriality. I hope you guys like freezing water and death! 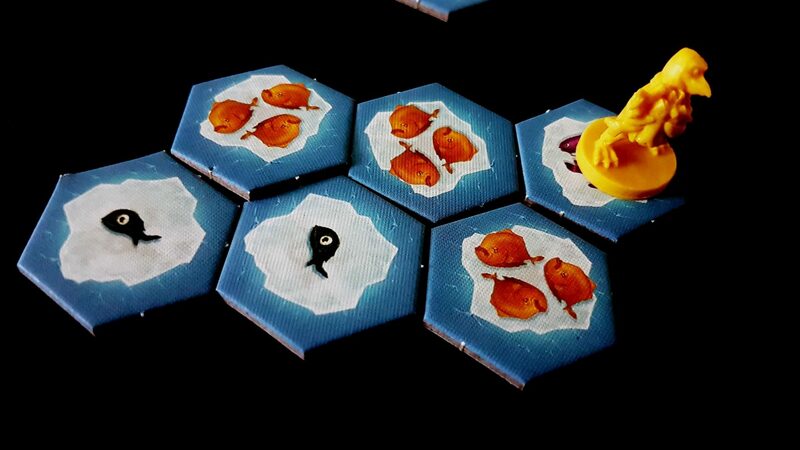 That image above is how you win a game of Hey, That’s My Fish. It’s not a race, although it looks like it. 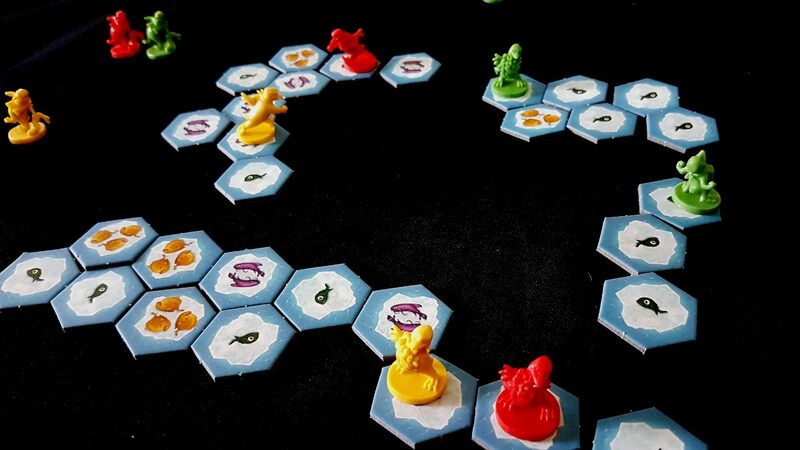 It’s not a game about the shifting economics of fish futures, although it feels like it. It’s about directing coastal erosion so that it isolates opponents that have strayed too far from safety. It’s about making sure that when you move, you’re guaranteeing that someone else is going to wish you hadn’t. 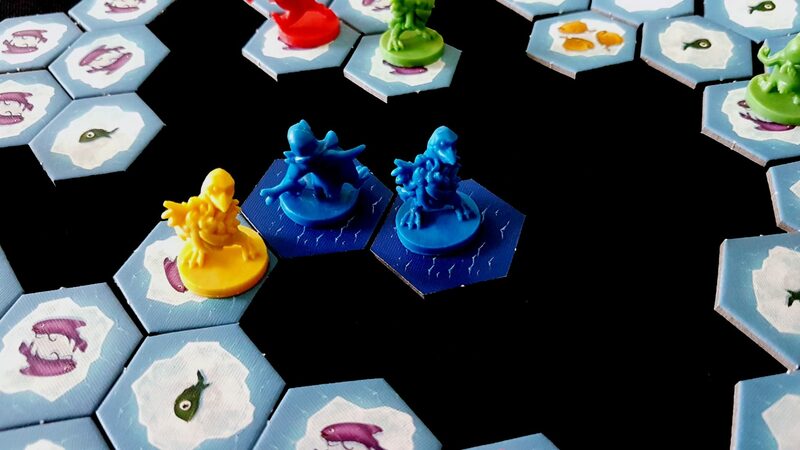 Hey, That’s My Fish is about making climate change work for you. You certainly can race to the richest hunting grounds but you always need to be wary because those are high traffic areas and the ice is treacherous. By the time your turn comes around again, you might find that you’ve been set adrift of the rest of the shelf. Maybe you’re the sole beneficiary of Fish Gulch, an exciting new property development rich in Omega-3 fats. Maybe though you’ve been played in such a way that you can only get one of those tiles before you block yourself off from getting any more. Or maybe you’ve been eyeing up the immediate prospect of the banquet and neglected to consider how you’re going to get home at its termination. I’ll never forget them, whatever their names were. Before you know it, the generous terrain of the Antarctic ice has been broken up and partitioned out into a chilly balkanisation that severely curtails not just your options, but the communal options of the entire table. Often in this game you’re doing as much damage to yourself as you are to anyone else. 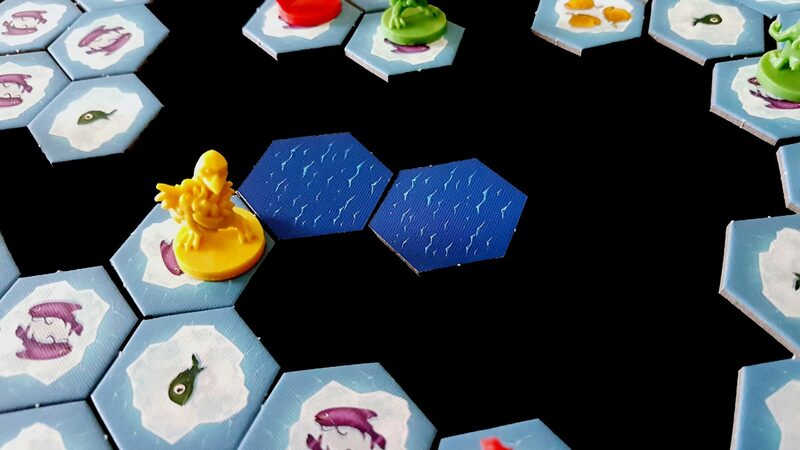 The wise player in this Hey, That’s My Fish considers how to mould the terrain before taking a bite of the fish stocks. If you play everything well, you’ll find yourself with an unchallenged claim to the most densely populated dining areas. If you don’t, you’ll find small comfort in the rapidity with which you are tossed into the deadly waters all around. When sinking to the icy depths of a fathomless ocean, a full stomach is the last thing you want speeding you on your journey. As you might expect in these kind of circumstances, the player that ends with the largest number of fish accumulated in their bellies is the winner, and that’s almost always going to be the one that played most aggressively in terms of movement and positioning. Hey, That’s My Fish reaches the apex of its charm when you’re alone and left to slowly and leisurely consume your way through a rich supply of fish like some kind of Pescetarian Pacman. The comparative nadir for any single person at the table comes when you find yourself well behind in Fish Futures and stuck with the grim leftovers on a tiny and shrinking island of hostile, unwelcoming ice. It’s good, for what it is – it’s very enjoyable. But again I come back to the point I made earlier in this review – there’s a lot of tedious setup that goes into a game that’s over in five or ten minutes. 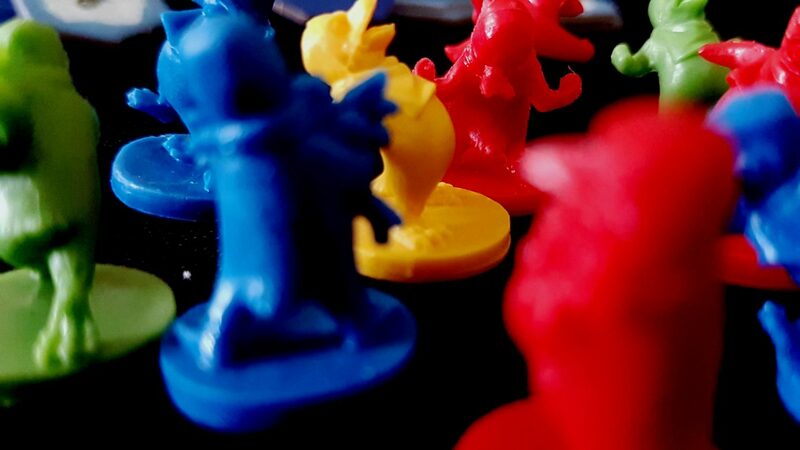 The game itself is perfectly engaging and worth your attention for the time you’re playing it. It’s hard to forget that it’s all over and done with very quickly. 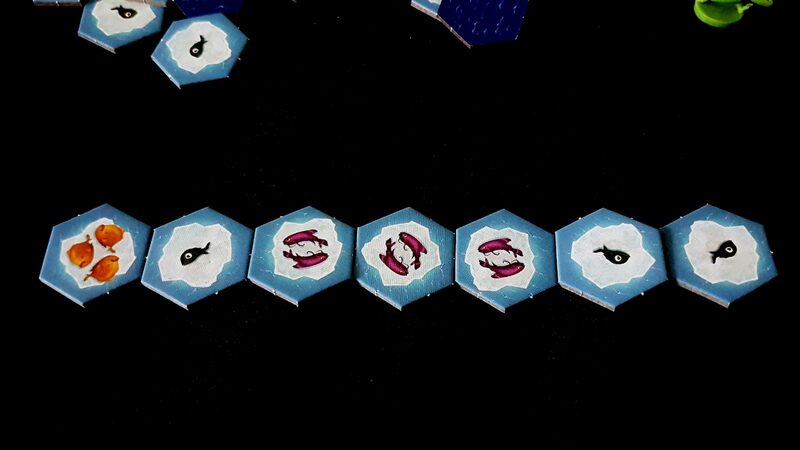 At the end you’re either just going to put it away or spend most of the advertised play-time placing awkward hexes next to other awkward hexes before you actually get to have any more fun. That is a real shame too, because I would like this game a lot more if I had more of a reason to break it out of the box. It’s potentially an ideal filler game for mixed audiences, but requires too much upfront investment to really lend itself to a recommendation there. It’s short and simple enough to be a marvelous gateway to more complex games of chess-style positioning and leveraging tactical advantage. Those kinds of short burst games work best when you can rapidly and effortlessly burn through a few sessions in a row to get the excitement building. Hey, That’s My Fish is the board-gaming equivalent of a potentially great TV show littered with ad-breaks for aluminium siding, PPI claims services, and discount coffins. You might certainly want to watch it but the time spent mired in the bad parts is always undermining the enjoyment of the good parts. Get the app though – in that incarnation Hey, That’s My Fish is well worth your time and money.